Hard on the heels of the comedy fundraiser for Reprieve comes another one, this time for homeless charity Cardboard Citizens. Stewart Lee and Robin Ince are on both bills but this time they're joined by the always original Josie Long and Bridget Christie (yes, we think she and Stew are definitely sharing back-stage childcare). 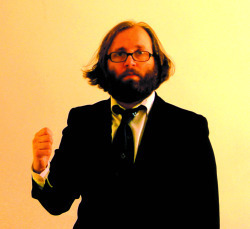 However, the most OMG news is that your compere for the evening is Daniel Kitson. The hirsute, 'reclusive', so-cult-it-hurts, comedian's comedian Daniel Kitson. Given that last year's event at the Hackney Empire sold out (this year it's taking place in the glittering West End) with the mere charms of Simon Amstell and Richard Herring, we think it would be wise to grab your tickets now before the Kitmeister's fans lunge for them. Bums on Seats at the Lyric Theatre on Monday 14th June at 7.30pm. Tickets cost £25 + a booking fee. Get more information or book tickets.